Read excerpt from right to left. 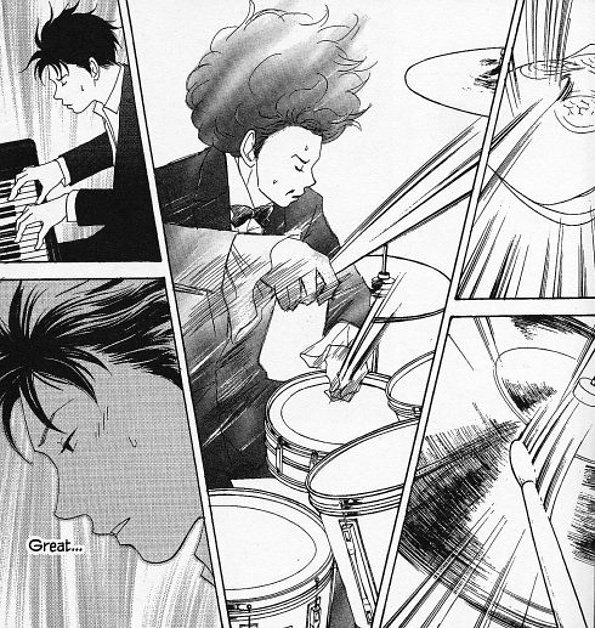 Music serves as both backdrop and metaphor in Nodame Cantabile Volume 6, ©2003 Tomoko Ninomiya. Nodame Cantabile is an understated soap opera following a small circle of music students in a prestigious arts college, and two in particular: Chiaki, a haughty, tightly contained music prodigy looking to make his way in the music world as a conductor, and Noda, a spacy and disorganized ditz whose sole apparent redeeming feature is her genius for jazzy improvisation on the piano. Naturally, they are constantly thrust into one another's lives, typical opposites destined for romance. While a more traditional soap opera might throw a variety of obstacles in their paths and make the pair fall in love as they overcome them, Nodame Cantabile takes a slightly different tack — its two ostensible romantic leads are so wrapped up in their own little worlds that they themselves become the obstacles. It's a wonderful display of delayed expectations, as situation after situation that a lesser writer might have played for sentiment instead becomes another lost chance, advancing the story but not necessarily the leads' would-be relationship. Have you ever seen two opposites clash so often and so fundamentally that you just want to slap each of them upside the head and tell them to get a room and be done with it? 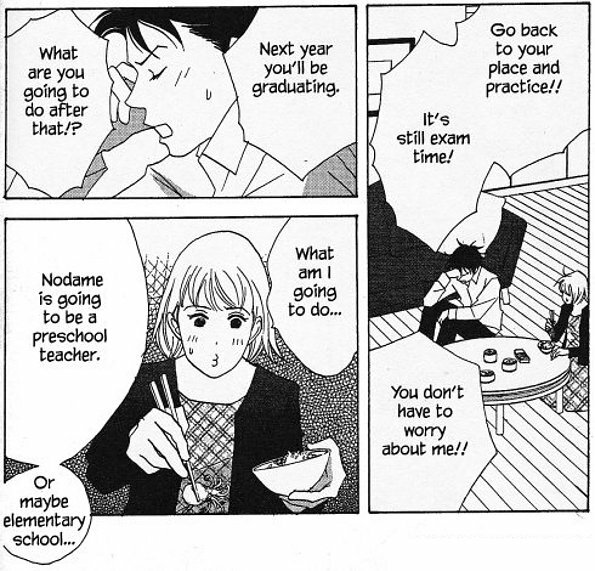 Creator Tomoko Ninomiya takes a perverse delight in leaving the reader wanting to do the same thing. As the latest volume opens, our cast of students are busy practicing for their upcoming final exams... all but Noda, that is, who has been taking her piano studies rather lightly for some time now. Earlier in the series, the gang had found themselves in a sort of B-list orchestra, which they had in turn forged into a top-notch musical ensemble largely through the instruction and inspiration of conductor Chiaki. With the conclusion of exams and subsequent graduation, the students find themselves wondering what their next step will be. There's a wistfulness in the presentation in these sequences, perfectly capturing the sense of a tight-knit group of students facing the end of an idyllic period in their lives. Even Chiaki, brusque and sparing in his affections, begins to let his guard down a little, itself a fairly impressive character development given his consistently self-centered attitude. Read excerpt from right to left. Chiaki and Noda clash as a matter of course. ©2003 Tomoko Ninomiya. As with much of the series, Ninomiya refrains from excessive melodrama, allowing the scenario to play itself out without calling undue attention to dramatic high points, and trusting to our familiarity with the dramatis personae to draw us into their world. Indeed, it's hard not to resort to symphonic metaphors when reviewing Nodame Cantabile; its creator has a solid sense of when to accentuate the highs and lows with just the right note, and understands that one can only do this by not hitting such notes very often. When she does bring out the violins and big brass, it's brief and controlled in intensity, and thus feels all the more important for its relative rarity. Case in point: towards the end of this volume, Chiaki returns home to his family, and due to a misunderstanding about his romantic attachment to Noda must take her back with him. It's here that his affection for her begins to rise to the surface, disguised as concern for her future as a pianist but obvious just the same. The resulting scenes are a masterstroke of presentation: Ninomiya effectively conveys Chiaki's feelings without making them obvious to any of the cast of characters, and a final confrontation between Chiaki and Noda feels earthshattering not because the scene in question is overplayed for operatic drama, but rather because a variety of storytelling points suddenly converge, contrasting against one another in artfully arranged counterpoint and then retreating to the background, leaving the reader to ponder the significance of the sequence while simpler harmonies carry the story toward the next movement. It's a superb performance. The result is a seamless and enjoyable storytelling experience, and I look forward to hearing where it will take me next. Mostly, though, I'm just hoping for someone to slap Chiaki and Noda upside their heads and tell them to get a room and be done with it.